Michael Mohammed Ahmad’s Tribe | Me fail? I fly! Though I’ve been mentioning Michael Mohammed Ahmad, writer, performer, actor, organiser and editor, in this blog and its predecessor for some years, The Tribe is his first book. It’s one of Giramondo’s Shorts series – ‘short form, short print run books, designed to take account of the new technologies of digital printing’. The Tribe narrates three episodes in the life of a Lebanese family living in Sydney – first in the inner west and then further out, in Bankstown – told by Bani, a son of the family who is aged seven, then nine, then eleven. The back cover blurb reminds us that ‘the representation of Arab-Australian Muslims has been coloured by media reports of sexual assault, drug-dealing, drive-by shootings and terrorist conspiracy’, and offers this book as a corrective. But The Tribe isn’t a defence or apologia: it’s a lively, intelligent, funny, weep-making portrait of an extended family. It’s clearly fiction, but if it’s not drawn from life than Ahmad is a true magician. Every member of a huge cast of characters constantly calls on the reader’s attention, and though there’s occasional confusion about who is related to whom, it’s a marvellous achievement that we mostly know exactly who is speaking and their place in the complex network. There is great warmth, mostly emanating from Tayta, the family matriarch. There is a wedding and a death, both of which are like every family wedding or death that I have been involved with, but dialled up to eleven and a half. By the last page, we feel as if we know these people. The book isn’t a communal hagiography – one of Bani’s uncles beats his wife; another is addicted to ice; an aunt has been more or less excommunicated because she and her husband were greedy for her legacy; grudges are treasured. During the wedding celebrations Bani’s father stares unsmiling at the door of the venue, armed with a hidden knife and ready for who knows what – the suspense is beautifully executed and the pay-off is unexpected, credible and deeply satisfying. I wonder which of the characters in this book he would hold responsible. Tayta, the grandmother racked with arthritic pain who is a source of great comfort and strength to her grandchildren? Bani, a sharp observer of the world of his family? Bani’s mother, whom we last see demented with grief? Uncle Ibrahim, addicted to ice and barely managing to be a decent family member? The refused suitors, the protective husbands, the fathers who rage and then beg forgiveness? 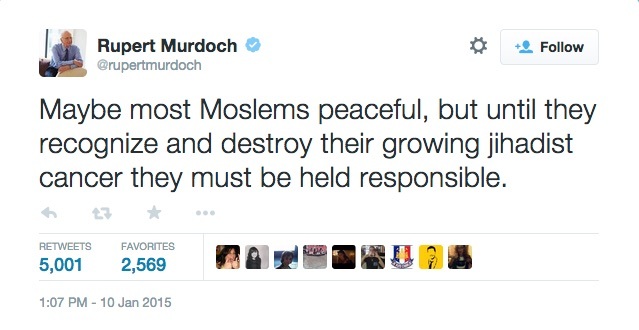 Mr Murdoch, if you chance to read this, I recommend – assuming that you won’t get out a bit and meet some non-elite Muslims – that you read The Tribe before the next time you tell ‘most Moslems’ what they must be held to. This entry was posted in Books and tagged Michael Mohammed Ahmad, Rupert Murdoch. Bookmark the permalink. Pingback: Sydney Writers’ Festival 2015: My Day 2 | Me fail? I fly! Pingback: Janeen Peres da Costa’s Saudade | Me fail? I fly!